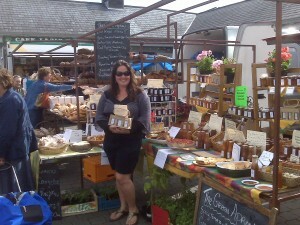 Here’s a picture of me at the market today. Love it when its sunny. 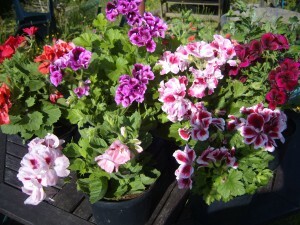 See the pelargoniums on the stall. I got these from Dennis who has been growing and selling these for many years in the market . He retired last season and was kind enough to provide me with stock for us to start propagating them for next season. Dennis says that August is the best time to start cuttings from the pelargoniums. He says they like the bit of heat to help them root better. Take sideshoots preferably without buds and dip them in rooting hormone powder. Then stick them in pots of seed and potting compost to root. 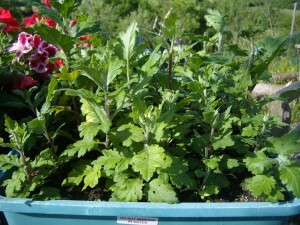 The chrysanthemums are wonderful old varieties which flower in Autumn and provide great flowers for cutting .I’ll put them out in a bed with rich compost for now.When they finish flowering in Autumn I will take up the roots and put them indoors until spring and then take cuttings to root. I don’t suppose you’d know where I could get my hands on rose or lemon-scented geraniums? 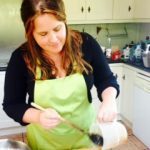 Since I killed the cutting that I propogated in Ballymaloe I’ve been on the hunt – I tried down in Hosfords (near Bandon) last week but they were all out of stock.